Saturday lunch time rolls around and we are again stuck without any lunch possibilities. I do not know what it is about "lunch" and why suddenly we are having such problems with "lunch." I don't know if it's just a North American thing: I do not recall me having a problem with "lunch" or the mid-day meal when I was growing up. Lunch was just a mid-day meal, with the same kinds of foods as you got for dinner. Here, it seems like "lunch" has become a second-class meal, merely a down-graded version of "dinner" and the idea that you eat the same kinds of food as dinner seems downright luxurious. Fish for lunch that's not canned tuna? Wow. Meat that's not a deli meat? Wow. For me personally, "lunch" has become somewhat fraught for me. On most days, I find myself now wanting food that falls under the genre of the "light lunch." Then there are other days when I want to rebel against the whole "lunch" thing and want to eat foods that belong to the dinner table. I wring my hands. I do not know how it has come to this. Perhaps it is a function of the North American workday which really leaves little room for a good meal. After all, I can't really take 2- to 3-hour lunches now, can I? Perhaps if I were higher up on the economic ladder I can, but I'm not. On most days, all I can manage is a little nibble here and there throughout the day, just to abate the hunger and prevent the fainting spell. Anyways, to segue properly to the topic of the post, the Vietnamese "lunch." When I think about it, Vietnamese food seems perfect for "lunch." 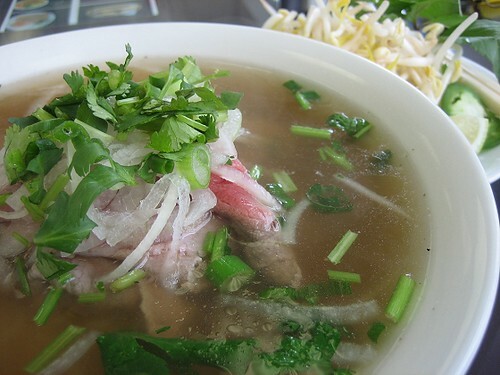 I like Vietnamese food: most dishes are light and non-greasy, with bright and refreshing flavours. The banh mi is a case in point. 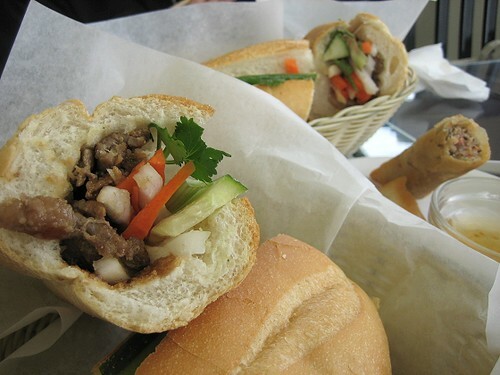 Banh mi is usually advertised as a Vietnamese sub sandwich -- and it is kind of a sub sandwich. I like the bread they use for these bahn mi: it looks like a French baguette but it is usually lighter than a French baguette. More airy it seems, not too heavy to fight with all the light and delicate flavours of the filling. I love the pickled vegetables that come inside a banh mi. In fact, I prefer them to the actual meat filling. The meat filling, for me, is the side show, more of the condiment than the pickled vegetables. Oh, it seems that I haven't really come to the topic of this post, which are the banh mi sandwiches we had on a particular Saturday morning in March. Since this post is already long enough, I figure I might as well give MORE backstory and tell how we arrived at our destination. When we set out to find "lunch," we were thinking of Aree's hot dogs again. We figure having one more Aree dog would give us more content for our previous Aree post. We wanted to go to confirm whether we were right in our original assessment or not. As we were driving. . . oops, make that I overdrove the spot where Aree was located. I debated whether to turn around and go back or just keep going. There is such a thing as inertia: therefore, I just kept driving. We figured we can get the same Aree-type bun at a Vietnamese place, so we set out to Au Petit on Main. As usual, there was no parking in front of the small cafe and there was a lineup again. TS went down and waited for our banh mi, while I drove around trying to find a parking spot. Finally, she emerged from the place with 4 sandwiches: 2 chicken banh mi and 2 meatball banh mi. I was very hungry, so I started to dig into my chicken sandwich while still parked. The crust of the bun being all crumb-y, there was a mess in the car. I figured this was no way to eat. We are not animals! I suggested that we eat someplace where we can actually sit down and enjoy the meal. So we ended up just a few stores south of Au Petit, which was Bon Cafe. I haven't eaten in the car since... well, actually, since we went to get hotdogs from Aree's the week before. But before that, I can't remember the last time I ate in the car. I don't like it. Like animals is right! pho from Bon Cafe; re photo: see the difference natural light makes! This is me rebelling against sandwiches! I ordered my usual rare beef pho. I have no complaints. Their broth was very clear in appearance and clean in taste. Although, I do wish it had a bit more oomph: perhaps a slightly stronger hit of star anise and fish sauce? I ordered the chicken sandwich again from Bon Cafe, just so I can compare the two sandwiches. The chicken filling from Bon is more flavourful and darker (fish sauce, sugar?) than the chicken from Au Petit. Both did not really give me enough of the pickled vegetables. On a scale of 1 to 10, 10 being the highest, these chicken banh mi were about equal, around a 5 for the Au Petit, 5.5 for Bon. The real winner among the banh mi, I was to discover, were the meatball banh mi from Au Petit. The meatball was very tender, very flavourful, and I was quite surprised at the delicacy of the porkiness. The pork-iness was not overwhelming, which is what I fear with Vietnamese deli meats. Quite delicious and I give this banh mi about a 7.5. My favorite banh mi was the grilled pork from Bon Cafe. Compared to the banh mi from Au Petit, this one seemed CHOCKFUL of grilled pork filling. It hit the spot with its sweet, savory, onion-y/shallot-y taste reminiscent of a childhood favorite (if anybody remembers, it was the "Pork Loin Burger" from Lei Garden in Manila, lo so many years ago). I'm wanting to go there right now and have it again, if only to imprint that taste in my mind. I would have to agree with the lack of pickled vegetables in banh mi. Although, I'm thinking that perhaps all these banh mi places put the "correct" amount of pickled vegetables and we are the ones who just happen to want more of them. The Au Petit Cafe pickled vegetables didn't have daikon! It was just pickled carrots. The Bon Cafe pickled vegetables had the requisite carrots and daikon. I really like Bon Cafe. It's a tiny place, very bright and clean, and it looks very well-cared for. The owner/servers spoke Vietnamese, so perhaps that makes the place more authentic? I will definitely have to return. Some folks especially those of the Caucasian persuasion do not have the pickled vegetables in their list of favorites. I'm like you I like the achara (aka pickled veggies.) 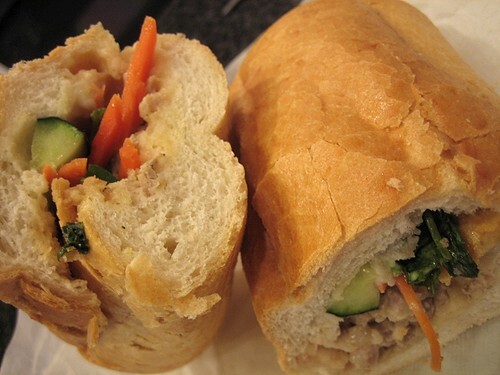 I think in most Vietnamese sandwich places you can ask them to put a little extra veggies in your sandwich.